You would think if one were at the top of the food chain there would be no problem with obstreperous neighbors. No harassment. No angry confrontations. No physical or verbal abuse. Not in this neighborhood! The Gray Hawk is flying toward me, out of the sun. It is the female. I have seen the pair flying together, her greater size so readily noticeable then, that now I am confident telling them apart when I see them flying singly. Female raptors are always larger than their mates. Preservation of the species, so the thinking goes. And she is further distinguished by her damaged central rectrices. She has two white fuzzballs in a nest high amongst the green boughs of the tallest pine tree in the area. He is perched in a snag, across the pond behind me, screaming. Not at me, but perhaps at her. He was screaming when I arrived, and he has been screaming off and on all morning. For no known reason except when the grackles discover him and chat him up. But that’s not the harassment I’m talking about. He doesn’t know harassment! My eye has picked her up quite a ways out. As she quarters away from the direct line of the sun, my autofocus engages and picks her up as well, but I am not confident. I am a Canon shooter, but neither Canon’s nor Nikon’s predictive autofocus works as well on objects coming straight in as on those passing across, parallel to the sensor plane. And pale bird against bright sky will render proper exposure problematical to say the least. I have abandoned my tripod this weekend, thinking (hoping) that hand holding for flight shots will offer more maneuverability and thus more opportunities. As she approaches, I hold the shutter down, shooting on continuous mode. While I am praying she slows down enough to let me figure out what the hell I’m doing and make camera adjustments, I am simultaneously praying she hurries up so I don’t fill the camera’s buffer before she is close enough to record in sharp focus what the hell she is doing. And then I see, in the viewfinder, a second set of wings. The hawk is in full soar, her wings outstretched and flat, but a second set of wings is visible above and inside hers, much smaller and flapping wildly, like the paddles of a kayaker caught in the maelstrom of a hurtling rapids, flailing desperately to keep his balance. A shock wave of awareness washes over me, adrenaline raising the hairs on the back of my neck, as I realize I have three species in my viewfinder! This is the shot of a lifetime, let alone the sighting of a lifetime, yet I know proper exposure and sharp focus will be pure, dumb luck. I know it will be over in about two seconds. I remember to breathe. I relax my left arm, which has started to shake badly with tension and excitement. I hold the shutter release lightly but firmly. In an instant she has flashed over my head into the pine, peeling away her “rider,” a Cassin’s Kingbird, at the first bough, and swept upward to deliver breakfast, the freshly dispatched Cotton Rat in her beak, to her awaiting brood. Had I not, just last summer, seen a juvenile Gray Hawk dismembering a Cotton Rat in this same neighborhood, I would have thought this choice of prey a bit unusual. The literature says Gray Hawks pluck lizards from trees in flight and will also take snakes, small birds, and large insects, but of course like all raptors this one aka the “Mexican Goshawk” is, above all, an opportunist. There is cropland in the area, dry riverbed, mesquite desert, three ponds, and even a golf course, certainly a smorgasbord of habitat for this pair’s foraging pleasure. But how pleasurable can it be having the ever vigilant, always irascible kingbirds for neighbors? Already this summer I have observed kingbirds, specifically Cassin’s, harassing all of Arizona’s “big three” migratory raptors—Common Black Hawk, Zone-tailed Hawk, and now Gray Hawk. But this is the first time I have witnessed an attacking kingbird not content to dive and scold and perhaps make talon contact. This Cassin’s was actually riding the female Gray Hawk’s back, leaning forward, pecking away at her nape and the back of her head. Don’t you just hate it when that happens to you on your way home from the grocery store? This may be the first year I have actively sought this trio of hawks while nesting is in progress. In past years I have typically looked for Blacks, Zonies, and Grays during earlier and later time frames: in April and May shortly after they have arrived and are setting up territories--the nasty neighbors, the kingbirds, haven’t themselves settled in this early in the breeding season; or in July and August when the young of the year have already fledged but are still hanging out in the neighborhood of the nest honing their hunting skills—the kingbirds, and the adult hawks too, have usually dispersed away from the area by this time. There are reasons for my field trip patterns. Motivation for the early season is that I’ve always wanted to witness the courtship displays of these Arizona specialty raptors. The closest I’ve come, however, is twice observing Gray Hawk copulation, once getting terribly backlit photographs that even the developers of Photoshop wouldn't be able to salvage. Late season trips have been motivated by my admiration for the juvenile plumage of these hawks. It is my humble opinion that the juvenile patterns of subtle creams and rich browns render Blacks and Grays the most beautiful of all our North American hawks, adults or otherwise, and that the spotted underparts of juvenile Zonies give a unique and unexpected twist to the relatively bland and undistinguished plumage of their parents. And what can be said of these cowboy kingbirds, returning time and again to the rough and tumble contest with an adversary many times their size and weight, like bull riders in a rodeo? They are aggressive and fearless, and have been aptly named for these very attacks. Cassin's is, after all, Tyrannus vociferans, in the family Tyrannidae, both the genus and family names coming to us from the Greek tyrranos for tyrant, ruler, or monarch, and the species name from the Latin vociferari. Yes, vociferous is a synonym for obstreperous, my adjective in the opening sentence. If "big" Sibley's weights and measurements are used, Gray Hawks are 12 1/2 times the heft of their screaming tormentors and twice the length and wingspan. That's aggressive and fearless, but let's look at the other side of the Gray Hawk coin. This is the second nest I've discovered today, and I've hung out at this one because its occupants seem unperturbed and oblivious to my presence. Is this because the nest is both high and set deep within the protective greenery of the pine, or is it because the tree stands on the edge of the golf course fairway and the parents are used to people passing back and forth? The first nest was not quite this high, but it was built in the top of a leafless dead snag in a relatively open and isolated area unused by people. Furthermore, there is on one side a hill upon which an observer is nearly at eye level to the nest, though certainly still much too far away to access it in any way. It was from this hill that I chanced to spot the nest and the screaming female spotted me. And, as I found out, she wasn't screaming at her mate. She was screaming at me. As I dropped off the hill to continue on my way, she left the nest, flew a short distance into a grove of live trees, and became silent. Even with my binoculars I could not pick her out amidst the leaves. I turned to leave and found myself negotiating an old cowpath along a narrow corridor, the steep hillside on my left, several tall, live cottonwoods to the right. At this point the nest tree was off to my right, but behind me, and though I was now much lower and walking away, I was actually closer to it than I had been on top of the hill. I had gone but a few steps when I was overcome with that odd sense that one who has spent a lot of time in the woods gets when things don't seem quite right. Perhaps it was just the tight confines of the cowpath, perhaps the oppressive air of the impending monsoon storm, maybe a sudden silence. I felt an urge to stop, quickly, turn around, and check out behind me. As I began to turn I heard the kingbird, the Cassin's that had been harassing the Gray Hawk after she had left the nest and hidden herself in the greenery. The Cassin's that had shown me where to seek her with my binoculars. The Cassin's, screaming vociferously. Coming in my direction. Coming down low. Coming right toward me. Now I was facing the sound, and I could hear the rush of wings. The Cassin's was riding the Gray Hawk! She was coming right toward me! Hurtling right at my face! Screaming! Now I was the third species in a scenario that would be over in about two seconds! She pulled up at the last moment, threw her "rider," and twisted away through the cottonwood greenery. Goshawks are accipiters, built for the quick, tight turns of aerial pursuit through the forest. Gray Hawks got their informal name, "Mexican Goshawk," because of their color and because of their ability to dash through desert woodlands snatching lizards in flight. Ever try to catch a lizard on a tree limb? Would she have pulled up if I hadn't turned around? 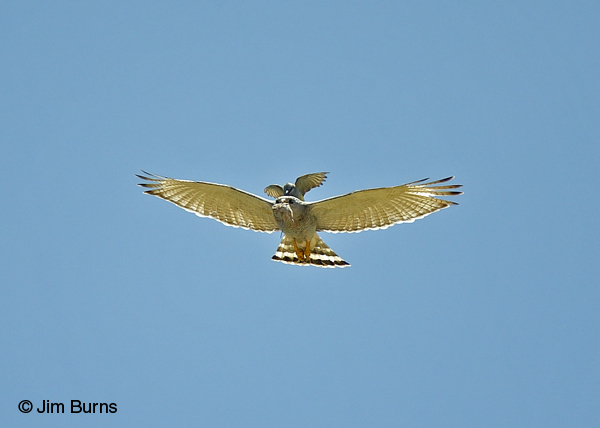 Like their kingbird neighbors, Gray Hawks are aggressive and fearless. It's a tough neighborhood.